In an arXived preprint submitted to Computational Statistics & Data Analysis, Chan, Han, and Lim study alternatives to EM for latent class models. That is, mixtures of products of Multinomials. (First occurrence of an indicator function being called the “Iverson bracket function”!) The introduction is fairly extensive given this most studied model. 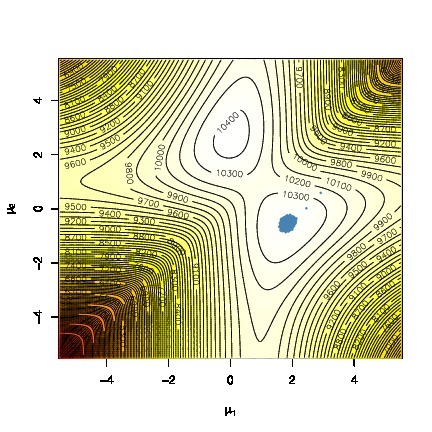 The criticisms of EM laid by the authors are that (a) it does not produce an evaluation of the estimation error, which does not sound correct; (b) the convergence is slow, which is also rather misleading as my [low dimensional] experience with mixtures is that it gets very quickly and apparently linearly to the vicinity of one of the modes. The argument in favour of alternative non-linear optimisation approaches is that they can achieve quadratic convergence. One solution is a projected Quasi-Newton method, based on a quadratic approximation to the target. With some additional intricacies that make the claim of being “way easier than EM algorithm” somewhat specious. The second approach proposed in the paper is sequential quadratic programming, which incorporates the Lagrange multiplier in the target. While the different simulations in the paper show that EM may indeed call for a much larger number of iterations, the obtained likelihoods all are comparable.